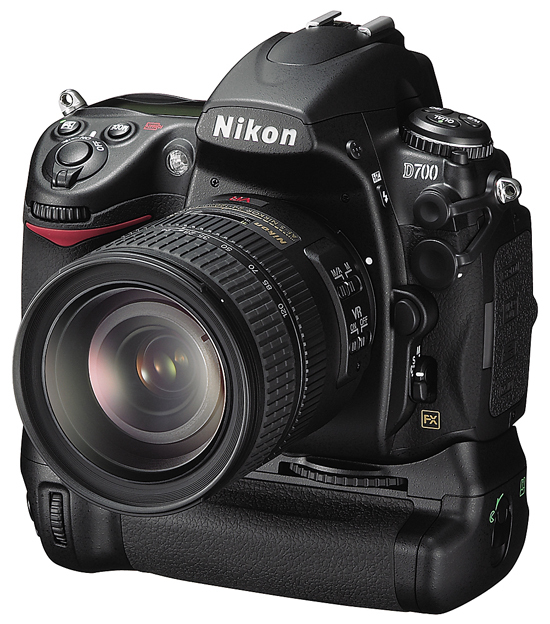 Nikon has officially announced the Nikon D700, a compact, professional, full frame (FX format) digital SLR. The D700 features the same 36x24mm, full frame, 12.1 megapixel CMOS sensor as the more expensive D3 model, and the D700 also offers and extensive ISO range of ISO 200 – 6400: extendable up to 25600 (equivalent) and down to ISO 100 (equivalent). 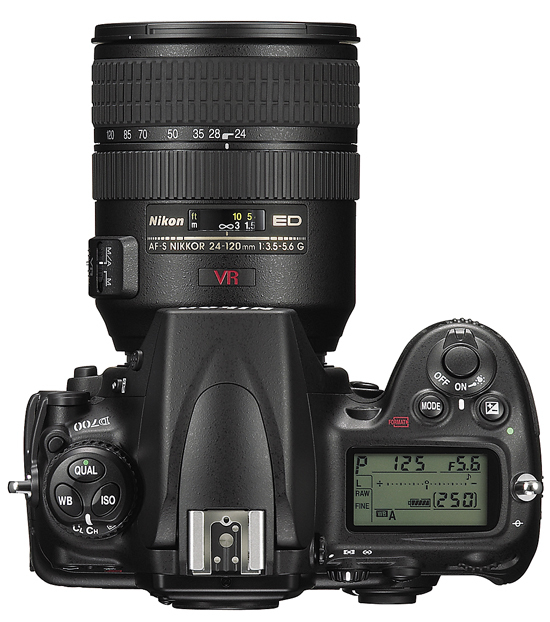 The Nikon D700 also features 5fps continuous shooting (8fps with optional MB-D10 battery pack), EXPEED image processing engine with 14-bit A/D conversion and 16-bit image processing for superb detail and tonal gradation, 51-point AF system, Live View function, 920,000 dot 3-inch VGA LCD monitor with wide, 170-degree viewing angle, HDMI video output and Active D-Lighting. 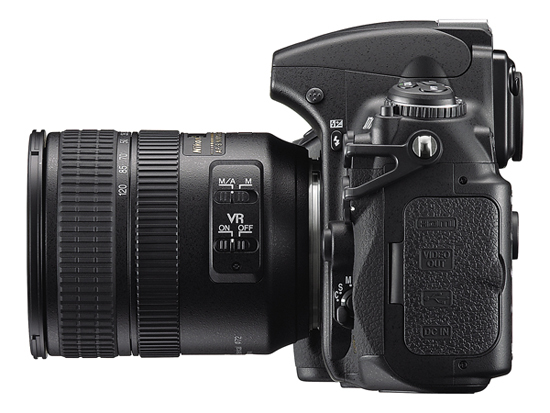 The D700 also includes several function improvements over the D3 including Image Sensor cleaning (‘sensor shake’), more flexible ‘hard button’ programming, virtual horizon in Live View and different DX mode indication on the focusing screen. 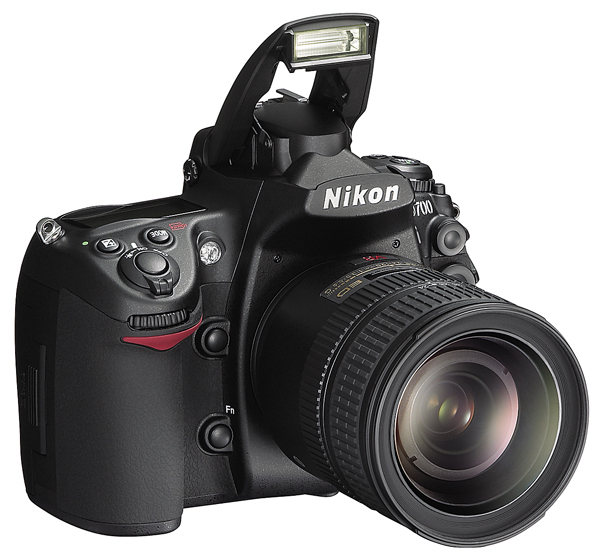 The D700 also becomes the first professional Nikon DSLR to sport a built-in flash. 12.1 megapixel FX (full-frame) CMOS sensor with high signal-to-noise ratio, wide dynamic range, and built-in self-cleaning sensor unit that minimizes dust. ISO 200 – 6400: extendable up to 25600 (equivalent) and down to ISO 100 (equivalent). 5fps continuous shooting (8fps with optional MB-D10 battery pack with lithium-ion battery EN-EL4a or 8 AA batteries). EXPEED image processing engine with 14-bit A/D conversion and 16-bit image processing for superb detail and tonal gradation. Picture Controls streamline in-camera image processing by enabling the pre-set customization of image parameters such as sharpening, contrast, brightness, hue and saturation in various color modes. 920,000 dot 3-inch VGA LCD monitor with wide, 170-degree viewing angle. Live View with Autofocus enables composition of images by use of the LCD monitor. Two modes are supported: Handheld or Tripod. DX Crop Mode can be automatically enabled when a DX format lens is attached. Quick response: approx. 40 ms shutter-lag. The new D700 incorporates an extensive array of features that boast a level of performance that is in many ways comparable to the D3. At the same time, it derives a wide range of benefits – including functionality, flexibility and operability – from the more agile D300, Nikon’s flagship DX-format D-SLR. The D700 has everything it takes to satisfy a broad spectrum of photographic needs. The 12.1-megapixel FX-format CMOS sensor with a sensing area of 36.0 x 23.9 mm; a sensitivity range of ISO 200 to 6400; continuous shooting at up to 5 frames per second (and up to 8 fps with the optional Multi-Power Battery Pack MB-D10; Nikon’s exclusive 51-point AF system; Scene Recognition System for optimum autofocus, auto exposure and auto white balance detection – these are but a few of the advanced capabilities of the extraordinary new D700. * Based on the new CIPA guideline established in August 2007. Nikon’s state-of-the-art EXPEED digital image-processing incorporates remarkable intelligence and technologies accumulated and optimized throughout our long history. It makes possible a diverse range of functions that ensure superior picture quality and high-speed image processing. Improvements to the exclusive 1,005-pixel RGB light sensor have allowed information from the sensor to be utilized for auto exposure, auto white balance and autofocus. 3D-Tracking in AF, for example, achieved by using the Scene Recognition System, tracks subject position and automatically shifts the AF points used to match the subject’s movement within the frame. This system also contributes to higher accuracy of auto exposure and auto white balance detection. Nikon’s Control System enables users, from novices to professionals, to create the pictures they envision by making specific selections and adjustments to image sharpening, tone compensation, brightness, tone and saturation. Even with different cameras, when the settings are the same, you get the same picture tone. Picture Control System offers four fundamental setting options – Standard, Neutral, Vivid and Monochrome – for easy customization of image parameters. 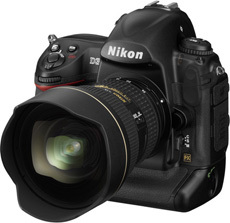 The D700 incorporates a Multi-CAM 3500FX autofocus sensor module featuring 51 AF points. Fifteen cross-type sensors located in the center enable subject detection with lens apertures as small as f/5.6. The functioning of the AF points is linked to the Scene Recognition System, to deliver superior subject detection and focus tracking performance. A single AF point can be selected from the 51 or 11 focus points. In Dynamic-area AF mode, you can select from either 9, 21 or 51 AF areas. The 51-point option offers 3D-Tracking mode, which automatically shifts the focus point to match the subject’s movements. Auto-area AF mode gives greater priority to the subject’s position when selecting AF points. A magnesium alloy is used for the exterior cover, rear body and mirror box to reduce weight and provide rugged durability. O-ring sealing where connections are made gives you valuable protection against dust and moisture. The shutter unit developed and manufactured by Nikon employs shutter blades made of a new material (a hybrid of carbon fiber and Kevlar). Tested on fully assembled cameras, the D700’s shutter unit has been proven through 150,000 cycles under demanding conditions. The self-diagnostic shutter constantly monitors and maintains shutter precision. • Type G or D AF Nikkor: All functions supported (PC Micro-Nikkor does not support some functions). IX Nikkor lenses not supported. Approx. 147 x 123 x 77 mm/5.8 x 4.8 x 3.0 in. This entry was posted in Digital Cameras, Nikon and tagged nikon d700, Nikon DSLR, Nikon Full Frame on July 1, 2008 by jonathanb. The Nikon D3 is the camera to get for shooting sports, news, events or action with its rapid-fire image capture and high ISO range, while the Nikon D3X will be the best Nikon for portrait and landscape photography. This entry was posted in Digital Cameras, Nikon and tagged Nikon, Nikon D3X on April 20, 2008 by jonathanb. DP Review reviews the Nikon D3 DSLR which features a full frame ‘FX’ 12.1 megapixel CMOS image sensor, high speed continuous shooting at 9 fps at full resolution (up to 11 fps in DX crop mode), a staggering ISO range of 100 – 25,600, 51 point autofocus system, and a 3.0 inch high resolution LCD monitor with Live View. This entry was posted in Digital Cameras, Nikon and tagged Nikon, Nikon D3 on April 20, 2008 by jonathanb. This entry was posted in Canon, Digital Cameras, Nikon and tagged Canon, Canon EOS, Nikon, Nikon D Series on April 8, 2008 by jonathanb. 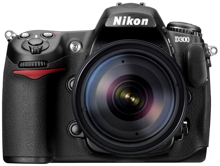 LetsGoDigital reviews the Nikon D300 a DX format DSLR (1.5x crop factor) with 12 megapixel CMOS sensor, 51 point AF sensor, 3.0 inch LCD and ISO range of up to 6400. This entry was posted in Digital Cameras, Nikon and tagged 12 Megapixel, DSLR, Nikon, Nikon D300, Nikon DSLR on March 28, 2008 by jonathanb.